200 people are missing and at least 31 are killed after Tropical Storm Erika barreled her way through the Dominica Island last week. The Prime Minister Roosevelt Skerrit is pleading with world leaders to come to the rescue of his Caribbean island nation. In a message to the nation on Monday night, Skerrit said 21 nationals and two French citizens are missing. Dominica need international assistance for recovery, rebuild and save all the people of the island. 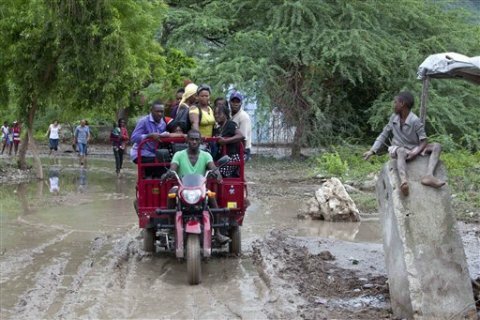 “We have written to all foreign governments – said Roosvelt Skerrit – for help and assistance and I can tell you that the responses that we have received thus far are tremendous.” At the weekend, in the immediate aftermath of the worst of the storm, which also brought heavy rain to Haiti and Cuba, the prime minister ordered the evacuation of Petite Savanne, a coastal village cut off by mudslides. Venezuela and Trinidad and Tobago were among the countries helping the evacuation effort by providing helicopters. The evacuations of Petite Savanne’s 750 residents was expected to be completed on Tuesday. “We welcome the evacuation process because it has been very difficult for us and we were in a state of helplessness since we had no communication,” Johna Guiste, a tearful Petite Savanne official, told AFP. “It’s hard and difficult to live, to take in and swallow what has happened to us,” she said as she boarded a coast guard boat to a shelter in the capital Roseau. Last week Skerrit said he feared the storm had taken the island back 20 years. China last week offered $300,000 as emergency humanitarian assistance.